Cheap Cruises From Baltimore - When and Where Can I Go? Cheap Cruises From Baltimore – When and Where Can I Go? Cheap cruises from Baltimore can take you on incredible adventures to the Canadian Maritimes, the Bahamas and the Caribbean, all from a port that is away from the hustle and bustle of those found in New York, yet still close enough to home to be convenient. Cruises from Baltimore are offered from both Carnival and Royal Caribbean and can take you straight to the Caribbean sun. One of Royal Caribbean’s 12 day trips includes stops in Haiti, San Juan, Charlotte Amelie, Philipsburg, St. John’s and Tortola in the British Virgin Islands. They also have a 12 night cruise that visits such places as Philipsburg, Basseterre, Aruba, Curacao, Cococay and Port Canaveral before heading back to Baltimore. On the other hand, Carnival can take you on a Bahamas cruise from Baltimore where for 7 days you visit the ports of Port Canaveral, Nassau and Freeport, two of the most popular islands in the Bahamas chain. Royal Caribbean also offers cheap cruises from Baltimore such as their 7-night trip to the island of Bermuda; the October 25th 2013 sailing is priced starting at just $549 per person. They can also take you to the lovely Caribbean and islands in the Bahamas, such as their 7 night trip to Port Canaveral, Cococay and Nassau or their 8 night jaunt that includes stops in Port Canaveral, Cococay, Nassau and Key West before heading back east. The east coast and Canadian Maritimes are impressive trips which many take, especially in the fall to witness the changing colors. Royal Caribbean’s 8 night trip can also be had as one of the cheap cruises from Baltimore with stops in Portland, Bar Harbor, St. John and Halifax. 7-day cruises from Baltimore that take you to either the Bahamas or Bermuda are great week long jaunts that allow you plenty of time to explore your destinations, but longer cruises up to 10 nights are also offered from the port in Maryland. One such trip, the Royal Caribbean offering takes you to the island of Cozumel before heading to the Cayman Islands, Jamaica Labadee in Haiti before heading for home. There may not be any weekend cruises from Baltimore offered this season, but the itineraries that are offered this year can more than make up for it. Once you check out all the cheap cruises from Baltimore you will see that this port is a great one for vacations to the sun, the golf, the scuba diving, the luscious beaches and the spectacular fall colors. 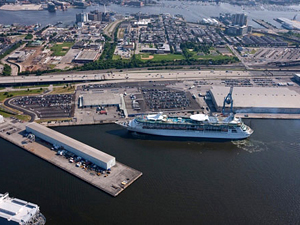 Whether you choose a Carnival cruise from Baltimore or head out on one of Royal Caribbean’s impressive ships Baltimore is a great gateway to many ports ahead.